Bollywood, the Indian movie industry, is on a campaign against the piracy of their movies. Who all are the culprits? Find and get surprised! India like all developing nation is a heaven for piracy. Weather it is software for the PC or the Mac, or mp3 songs CD of all the release for the month. They are all available for sale for Rs 25/- (USD 0.5) in the corner shop of any major market. DVDs, CDs, games you name it you get it. In India one of the prime affected industry is the Indian cinema Industry, which churns out the highest number of movies per year worldwide. A major portion of this industry is the Hindi cinema industry. This industry based in Mumbai (Bombay) which is affectionately called the Bollywood. Whether it is the music or the movie itself, all get pirated and available on the streets, or online on umpteen number of web sites, or through P2P software like Kaaza, eDonkey or others. Movies which are released in India generally get pirated in the same week (over the weekend) as the release of the movie. The so called Hall Prints are available for sale on the streets and CD vendors by Sunday or Monday through out the country. Even the local CD rentals make those CDs available in the same week. Though these prints are horrible and sound track pathetic, then also the public does not mind as it saves then at least Rs 60/- to 125/- per person if they went for the nearest multiplex. That comes out to be around Rs 250/- for the complete family. But the irony of the story does not begin here. The very movie that are pirated on the streets are many times a piracy itself! Now that is the twist that is the most surprising. The fact is that the movies that are churned out by this industry is itself pirated by varying degree from other cinemas of the world. The major cinema at loss is the Hollywood, but that is not the end. Language or country is not a barrier in piracy. If a movie is good then the directors/producers do not think twice before ripping it off and packaging it in a different container for the Indian audiences. 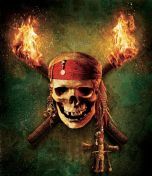 The level of piracy varies from movie to movie. Some of the movies are scene-to-scene and dialog-to-dialog copy, others are just plot rip offs or story rip offs. Some go and do a mix-and-match by copying number of different movies to provide a soup to the audience. Some just copy a scenes or a sequence and append them in their movies. Songs are another major piracy hot spot and pages can be written about it. It is also not that the movies are getting pirated in the recent years. Its a fact that even the old timers used to pirate the movies. I remember this classic example of piracy. In one of the Devanand's major movie a small sequence of villain den was ripped off as it is from one of the James Bond's movie. It was I think only 2 seconds of the movie that was ripped off, but is utterly disgusting. For copying the entire movie, take the example of 1980's The Burning Train starring the biggies of that era like Dharmender, Vinod Khanna and Jitendar. This movie was a copy of a Japanese movie Shinkansen Daibakuha which was released in 1975. Recent victims of this Bollywood's Piracy (hence Bollywean) are Korean movie Oldboy (Zinda), English movie Man on Fire (Ek Ajnabee). The list goes on. Most commercial movie that are made has some element ripped from the other cinemas of the world. It is also true that now days the awareness of this piracy is increasing day by day. In reviews of the movie the reviewer mentions the movie from which it is ripped off. Internet has many posts in discussion forums which discuss this piracy. Dedicated sites are present that record and keep track of the piracy in movies churned out by the Bollywood. I sincerely hope that such spread of knowledge will curb the piracy and will ultimately make these Pirate of the Bollywean also extinct like the other pirates of the seas. For this information I have maintained the site http://www.akhilesh.in/life/india/bollywoodinspirations.php where such pirated movies are reviewed and rated on the piracy level.